Remember those old Halloween movies that aired on the Disney channel in the 90’s and 00’s we all loved? From what I can see this feels JUST like that. Is that a bad thing? Hell no! I loved those movies, everyone did! Will I pay 10 dollars to go see one of those? No, definitely not, but your kid might like it! 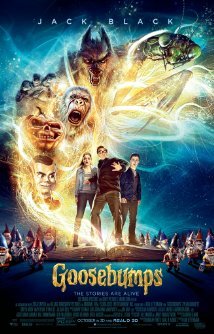 Goosebumps stars Jack Black and nobody else important, it calls on so much nostalgia that it is almost not even fair! The story follows a boy Zach, who moves in next to a girl Hannah, and author R.L Stine. When Zach thinks that Hannah is in trouble he breaks into her house and opens a goosebumps book letting out the monster in it, somehow every monster gets let out and they need to put them back! I love the idea of it being about the author and the books themselves, and the monsters he created escaping. I think that is a brilliant take on iconic series and I am very exited to see this, but only cause of my nostalgia, and only when it is on DVD. Goosebumps was such a big part of my life. I think I may go see the movie.